Malheur River Diversion - Quadrant Consulting, Inc.
​QCI provided topographic and boundary surveying, design, permitting, environmental compliance, construction administration, and construction staking services for the reconstruction of an existing concrete jack structure irrigation diversion on the Malheur River for the Burns Paiute Tribe. The project design incorporated a similar concrete crest with jack structures to provide sufficient head for irrigation deliveries, a rock ramp downstream of the crest to provide for channel grade transition, and a concrete pool and weir fish passage meeting Oregon Department of Fish & Wildlife Services passage criteria. 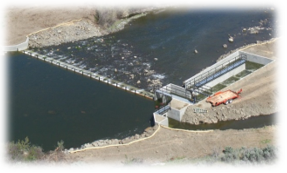 The diversion structure is 119 feet long, approximately 42 inches high, and facilitates the delivery of 13 cfs for irrigation.